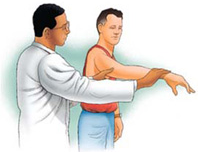 The shoulder joint has a wider range of movement than any other joint in the body. It consists of three bones: the scapula; the humerus; and the clavicle. The scapula or shoulder blade is the large triangular bone located on the backside of the upper body The humerus is also known as the upper arm bone. The clavicle or collarbone attaches the shoulder to the rib cage and holds the shoulder out from the body. Several ligaments stabilise the shoulder joint, whilst other soft tissue helps the joint to move and flex easily. 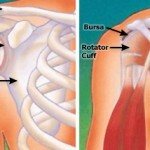 The rotator cuff is a complex of four tendons that connect the upper arm with the shoulder blade. It holds the head of the upper arm firmly into the shoulder socket when moving. The tendons connect the muscles with the bone, which moves when the muscles pull on the bone. The bursa is a pocket of lubricating fluid, which allows muscles to move freely over each other. It is located under the collarbone, between the rotator cuff muscles and the larger surrounding muscles. The surgeon will conduct a physical examination and may order X-rays, CT Scans or even an MRI to determine the exact cause of the problem. It may be necessary to perform a shoulder Arthroscopy to ascertain the extent o f damage or to locate the problem. Initial treatment may be a course of physiotherapy or cortisone injections to promote natural healing. the surgeon may suggest that the arm is immobilized in a sling so as to allow the damaged tendons and ligaments to heal. If the damage is considered to bad or the above methods fail to improve the condition then surgery may be considered. 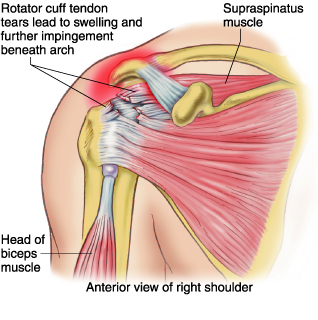 Impingement and Partial Rotator Cuff Tears : Partial thickness rotator cuff tears can be associated with chronic inflammation and the development of spurs on the underside of the acromion or the acromioclavicular joint. The conservative nonsurgical treatment is modification of activity, light exercise, and, occasionally, a cortisone injection. Nonsurgical treatment is successful in a majority of cases. If it is not successful, surgery often is needed to remove the spurs on the underside of the acromion and to repair the rotator cuff. Full-Thickness Rotator Cuff Tears : Full thickness Rotator Cuff tears off generally when there is a heavy lifting or a fall. When non-operative treatment like exercise and modification of activities do not work, surgery is required for the full repair. Spurs are removed by arthroscopic technique and repair of the tears in the rotator cuff is done along with it. Instability : Shoulder instability is a problem that occurs when the structures that surround the shoulder joint do not work to keep the ball tightly within its socket. If the joint is too loose, is may slide partially out of place, a condition called shoulder subluxation. If the joint comes completely out of place, this is called a shoulder dislocation. Patients with shoulder instability often complain of an uncomfortable sensation that their shoulder may be about to shift out of place. Fractured Collarbone and Acromioclavicular Joint Separation : A fractured collarbone and acromioclavicular separation are common injuries of children and others who fall on the side of their shoulder when playing. Most of these injuries are treated nonsurgically with slings or splints. Severe displaced fractures or acromioclavicular joint separation may require surgical repair. Arthroscopy – Arthroscopy allows the orthopaedic surgeon to insert a pencil-thin device with a small lens and lighting system into tiny incisions to look inside the joint. The images inside the joint are relayed to a TV monitor, allowing the doctor to make a diagnosis. Other surgical instruments can be inserted to make repairs, based on what is with the arthroscope. Arthroscopy often can be done on an outpatient basis. 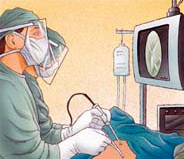 Open Surgery -Open surgery may be necessary and, in some cases, may be associated with better results than arthroscopy. Open surgery often can be done through small incisions of just a few inches. Recovery and rehabilitation is related to the type of surgery performed inside the shoulder, rather than whether there was an arthroscopic or open surgical procedure. Minimally Invasive Surgery is performed by inserting special instruments and an arthroscope through small incisions in your shoulder. This approach is also known as arthroscopy. An arthroscope is a thin, lighted instrument with a small camera. The camera transmits pictures of the inside of your joints to a video screen viewed by your surgeon as he or she performs the surgery. Minimally invasive surgery generally involves a faster recovery, less pain, and less risk of complications than open surgery. This is because it causes less damage to tissues and organs. Your surgeonwill make small incisions instead of a larger one used in open surgery. He or she can then thread surgical tools around structures and organs instead of cutting through or displacing them as in open surgery. Mini-Open Surgery uses newer technology and combines minimally invasive arthroscopic techniques with a smaller open procedure. The incision is one to two inches long, which is smaller than a standard open surgery incision. This technique may allow some surgeons to make more extensive repairs than are possible with minimally invasive surgery. However, it causes less damage than traditional open surgery because your muscles remain attached during the surgery.